Every recession doesn’t have to trigger a bear market and every bear market doesn’t have to be associated with a recession. 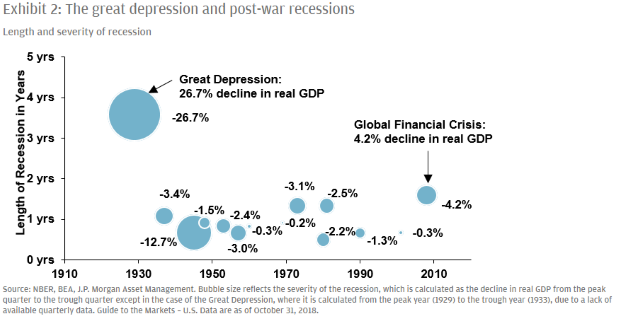 Since 1929, the U.S. has seen 10 bear markets and 14 recessions, with only eight of these associated with recessions. 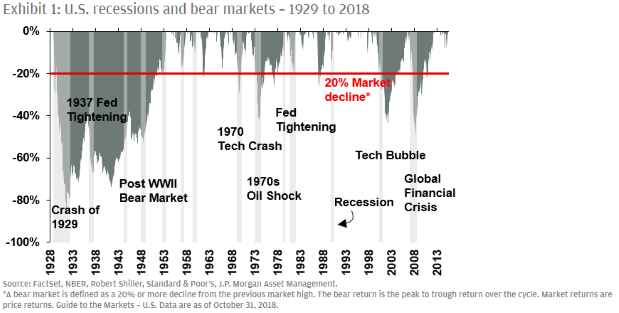 Moreover, the two bear markets that were not associated with recessions, ended within six months. Therefore, although other triggers are possible, a recession is the most likely cause of a sustained bear market in U.S. stocks. This is very difficult to answer. Analysis over the last few decades suggests the chances of entering recession in any given quarter is less than 5%. However, there is good reason to believe that the economy is generally more vulnerable to recession late in a cycle and when it has low unemployment. Later in a cycle, there is a lack of pent up demand, greater difficulty in filling open positions and often higher interest rates as the Fed seeks to head off inflation and asset bubbles. All of these problems are, to some extent, present in the current environment. However, in addition, the economy in 2018 was boosted by substantial fiscal stimulus. 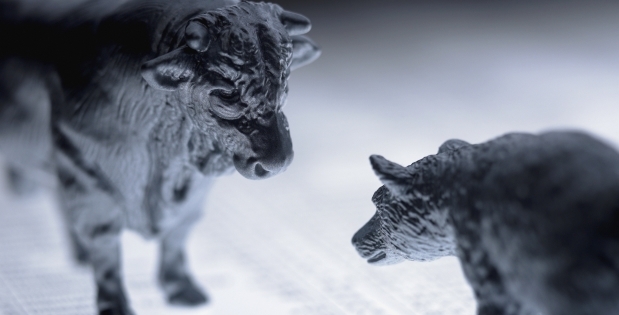 As that effect fades towards 2020, the economy should grow more slowly, and this, combined with some exogenous shock could trigger a recession, potentially resulting in a sharp stock market decline. While there is a good chance that the U.S. economy could see both a recession and an equity bear market in the next few years, it is important to have a realistic perspective on the magnitude of both. This may be difficult for some investors, since the last recession was the single biggest recession in the post-WWII era and the last two bear markets in U.S. stocks each saw declines of roughly 50%. Diminished quarter-to-quarter volatility in real GDP and research from J.P. Morgan Asset Management suggests that better inventory management, a more stable housing sector and the growth of the more stable services sectors have all contributed to the economy increasing in stability over time. With this in mind, the next recession is more likely to resemble the relatively mild recessions of 1990 and 2001, than the monster recession of 2007-2009. Additionally, the next bear market should not be as fierce as the last two. In the last two bear markets, the U.S. stock market fell by an average of 50%. However, in the previous nine recessions, the average decline has been just 24%. This makes intuitive sense – the last stock market tumble occurred against a backdrop of the single biggest recession since the Great Depression, while the stock market entered the previous bear market with valuations that were a full 50% higher than the average forward P/E over the last 25 years. 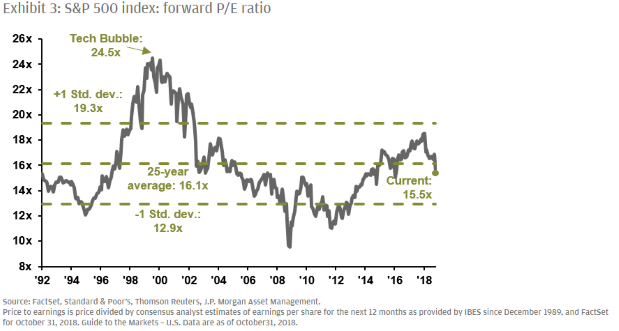 As investors consider how to prepare, it is important to recognize that this involves melding together two separate strategies: (1) how to get the best, risk-adjusted returns before the onset of a bear market and (2) how to be as prepared as possible when the bear market actually occurs. The traditional advice in entering a bear market is to have a heavy allocation to Treasury bonds. Some fear that this time around, given low interest rates, Treasuries have less potential to act as an offset to equity market losses. However, as can be seen in Exhibit 4, recent history does not support this fear. So, how much could portfolio losses be reduced by moving from a stocks-only portfolio to a 50/50 equity/Treasury portfolio? The answer is that total portfolio losses can be reduced by between 51% and 64%, but the offset appears to be independent of the prevailing level of interest rates. 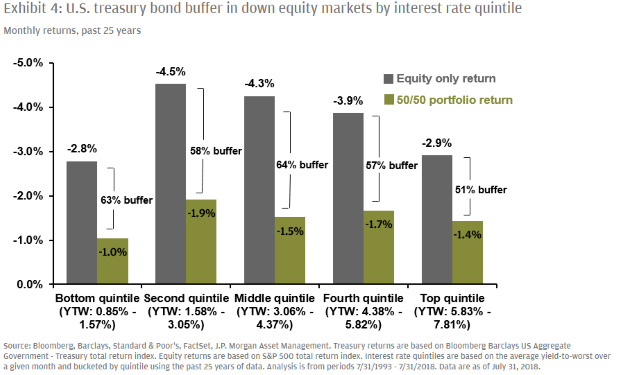 The reason for this is clear enough – even though the coupon payments on bonds are lower at lower interest rates, the duration of bond portfolios is longer, allowing for greater capital gains when interest rates fall. The upshot of this is that Treasuries are still positioned to provide some protection in a bear market for stocks. A second worry for those preparing for a bear market in U.S. stocks is that diversifying internationally cannot work since, metaphorically, when the U.S. sneezes, the rest of the world catches a cold. Data from the last 25 years only partly support this contention. 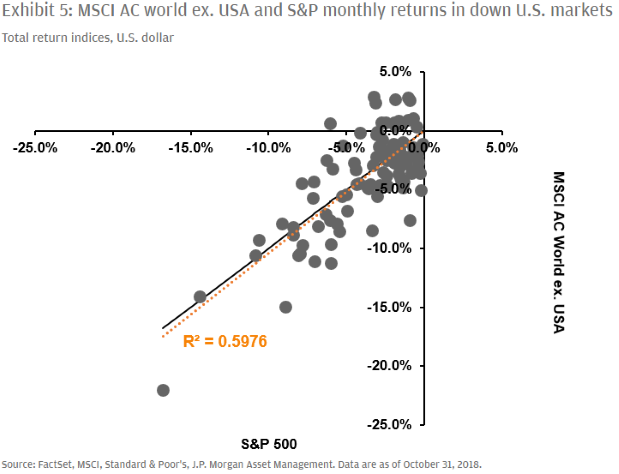 Again, looking at only those months in which the S&P 500 provided a negative total return, the MSCI AC World ex. USA generally fell by the same amount as the U.S. whether the U.S. drop was small or large. Thus, the reality is that when the U.S. catches a cold, the rest of the world catches a cold as well. In short, there is little evidence to suggest that bonds will provide less protection or that international stocks will provide more protection in the next bear market than in its predecessors. Given a still relatively sunny financial environment, should investors be actively preparing for the next storm or busily accumulating winnings while they have the chance? The answer, of course, is a bit of both.